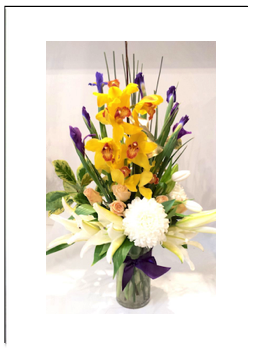 VF26 Cymbidium Orchid Flowers with Roses, Blue Irises, Lilies, Chrysanthemum Pom Poms and sticks delivered in glass vase. Send your wishes with all your love with this exciting mix with Cymbidium Orchids. Price includes Glass Vase. Cymbidium Cut Orchids and chrysanthemums are extraordinary flowers to enjoy for weeks. Just recut and change water before they turn cloudy for longer lasting blooms. Store Pick Up can be arranged 7 days a week.